Every year, millions of Muslims engage in one of Islam’s holiest month — Ramadan. As a religious tradition, it is undeniable that the practice of fasting and praying are here to stay. However, with a changing generation, it lead me to wonder whether the cultural aspect of Ramadan is shifting and what do Saudis today have to say about the traditions that have come and gone and what is here to stay? I interviewed five Saudis who shared their memories and experiences of Ramadan and their insights are interesting, profound and even funny. Q: Do you know of any old Saudi traditions that are practiced during Ramadan and are hardly or no longer practiced today? Al-Alim Y.: The religious traditions are still very much practiced. Joharah: Let’s see…there was this lovely tradition when all the neighbors in an area would block off the road and set up a tablecloth in the middle of the street. Each neighbor would then bring one dish with him and everyone sits together over the same-shared Iftar. It is such a beautiful, communal thing to do, but I feel sad that it seems to have died out in these recent years. Mohammed: There’s what we call “Gurgaian” wherein children of each neighborhood would go around carrying pouches that their mothers had made or paper bags and knocking on doors; once a door is open they would sing the “Gurgaian” song of which after they would receive a mixture of nuts/sweets mixed with some coins. Amal G.: I’ve heard stories about the Al Musaharati — men who wake up people in their community during Ramadan by beating drums and singing songs before Al Sahour. They are usually followed by children singing along with them. 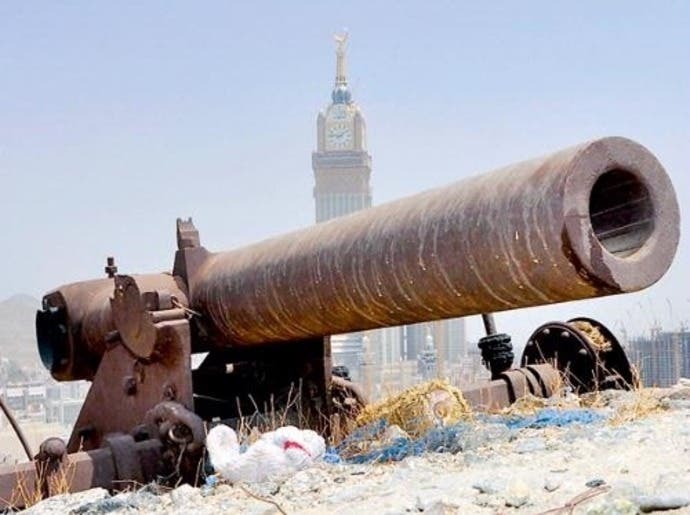 I’ve also read about the Ramadan Cannon, which was used in the early 1800s to help announce that it was time for Iftar. I believe during those days they did not have the technology of speakers so a cannon would do the trick. Nowadays, the canon still exists but only for symbolic purposes. Q: Are there new traditions/practices during Ramadan nowadays? Omar H.: Back in the day, we would conduct small football contests between different teams. We used to play it after Taraweeh for almost two hours. Nowadays, young people play it using PlayStation instead. Al-Alim Y.: It seems like hanging out with either friends or family in coffee shops is at a rise. Mohammed: There’s the “tribal size” (not just family size) of packed items that you’d find in supermarkets and the Iftar outings to hotels and restaurants are commonplace now. Q: Is there a difference on how Ramadan is practiced now to that of your younger years (childhood)? Amal G.: Yes, some people seem a little bit distant now because of the constant use of electronic gadgets like iPads and mobile phones. I feel like people in the past were more personally engaged, but there are still some like that I guess. Mohammed: I think nowadays, instead of us receiving the gifts (as children), we are now the ones giving out “Eidiyahs” during the Eid so the difference is that I’m going broke. Omar H.: From a religious point of view, I believe the traditions are still practiced in the same manner because of the strong religious influence throughout our society. Q: What is the true meaning of Ramadan, for you? Joharah: The spiritual essence of the month. It’s beautiful. Al-Alim M.: It’s a month of forgiveness, giving, peace, love, faith, hope, patience and harmony. Mohammed: For me, it could be summed up in three words: Where’s The Food?! Seriously, with fasting, one doesn’t need to get high to have the munchies. Amal G.: Ramadan is not about skipping meals, but it has a strong spiritual value. I see it as a time to renew our commitment and re-establishing our relationship with our creator, Allah. Omar H.: If there was one word to describe Ramadan, I think it is spirituality. It is clear that the central theme of Ramadan thrives on. Certain cultural practices may have died a natural death due to the modern, technological advances and these are only normal over the course of time. The important thing is that the true essence of Ramadan remains in the hearts and minds of every Muslim. Through fasting, sacrifices, prayers and exhibiting generosity and kindness to others, Muslims achieve a closer and more meaningful relationship with Allah.